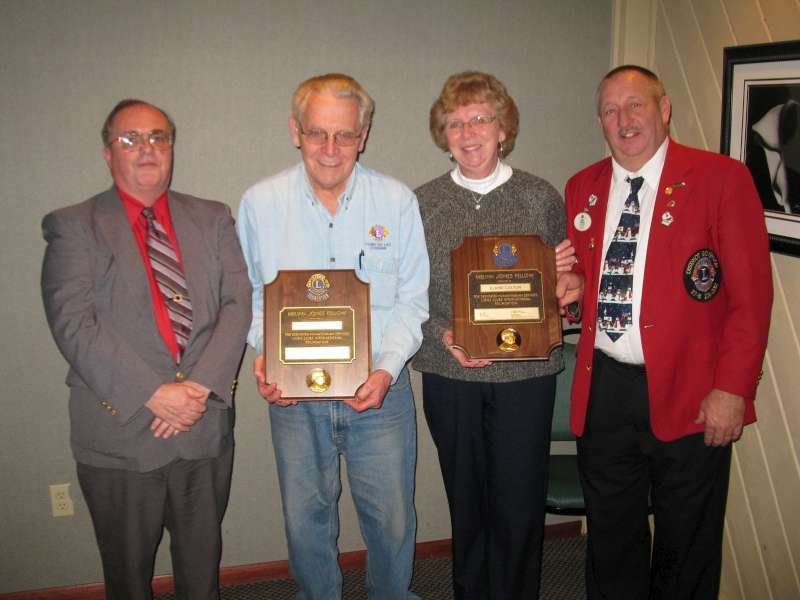 December 2011 -- Bob Berryman and Elaine Colton received the prestigious Melvin Jones Fellowship at the Fond du Lac Evening Lions Christmas party. The fellowships were presented to Bob and Elaine by the club for their continued support to club activities and fund raisers. A Melvin Jones Fellowship is awarded by the Lions Clubs International Foundation upon receipt of a $1,000 donation by the club or an individual to the foundation's relief fund. Bob has been a member of the Downtown Green Bay and Fond du Lac Evening Lions Clubs for 40 years and has completed a term as president of the club. Elaine joined the club in 2005 and has been active chairing the Lions Mint sales and the collection of used eyeglasses and hearing aids. Pictured are Gary Silah, president, Bob Berryman, Elaine Colton and Merle Strelow, District Governor of 27-B1. Other FDL Evening Lions that are Melvin Jones Fellows are Wayne Bargenquast, Frank Bartzen, Charles Browning, Tom Bucher, Betty Clausen, Tom Clausen, Gary Colton, Erv Karls, Mike Konen and Gary Silah.